Robert A. Henle was born on 27 April 1924, in Virginia, Minnesota. He entered the Navy in 1944, qualified as a carrier dive bomber pilot, and was released to the active reserve in 1946. In 1949 he received the BSEE degree from the University of Minnesota and, continuing with graduate studies, began work on point-contact transistor circuits. After receiving his master's degree in 1951, Henle joined an IBM group involved in studying the applications of transistor technology to computers. This work led to the development of the IBM 608 transistor calculator, the first solid-state computing system in production. He then helped develop high-speed circuits used in the IBM Stretch and 7090 computers. In recognition of these contributions, he was appointed an IBM Fellow in 1964. Henle then turned his attention to the development of monolithic memory technology. A 16-bit chip used in the memory-protection device of System/360 Models 91 and 95 was the first product realization of these efforts, which ultimately resulted in the first all-semi- conductor main memory in a commercial computer -the IBM System/370 Model 145, shipped in 1971. Henle was appointed manager of advanced technology for IBM's Components Laboratories in 1975. In 1980, he was made director of the Advanced Silicon Technology Laboratories, an interdivisional facility with company-wide responsibility. Several of IBM's current semiconductor technologies have originated in its laboratories. Since 1970, he has also served two terms on IBM's Corporate Technical Committee, a body that oversees the company's research and development strategy. He has published over 25 papers and has been granted 48 patents in computer technology. In 1966 he was elected Fellow of the IEEE and has been active as secretary of the Computer Society, chairman of the Awards Planning and Policy Committee, chair-man of the IEEE Computer Elements Committee, chairman of the Computer Society Fellow Award Committee, and chairman of the Mid-Hudson Subsection. 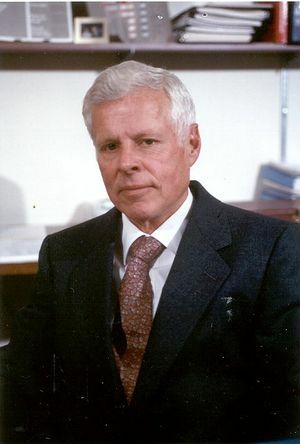 He received a Department of Defense Citation for "Exceptionally Meritorious Civilian Service" in 1974, was elected to the National Academy of Engineering in 1982, and received the IEEE Edison Medal in 1987 "For sustained leadership in, and individual contributions to, the science and technology of semiconductor circuits for computing systems." Henle has four children by his first wife Marjorie Bonnell (deceased), a daughter Barbara and sons Bob, David, and John. Now married to the former Carol Y. Dumas, he lives on a farm in NY. His outside interests include sailing, skiing, tennis, photography, motorcycles, and jogging. This page was last edited on 24 February 2016, at 20:15.